The oven is a critical part of your kitchen, and your home. If it stops working, it should be repaired or replaced right away. Most oven repair jobs are relatively small, requiring oven parts like the bake and broil elements and fuses to need replaced. However, hiring a professional Campbell oven repair company to diagnose and resolve the issue is definitely a good idea. Our appliance repair specialists are always available to help you. During the service call visit at your Campbell CA home, one of our repair specialists will diagnose your oven problems. From here, we will know the oven parts that need replaced. Our repair specialists can then go out and pick up the oven parts in Campbell CA and come back to finish the replacement. 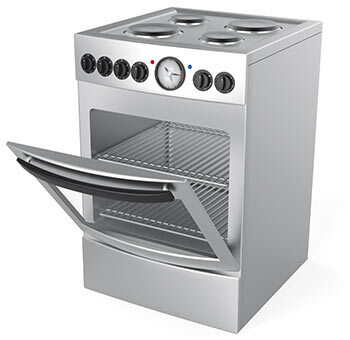 When clients come to us for an oven repair in Campbell CA, we provide our services at a reasonable price. To do this, we offer oven repair estimates by referencing the values denominated in the Major Appliance Service National Price Guide for replacement parts and labor. Our highly trained repairmen are oven repair specialists and have successfully fixed ovens in the Campbell CA area for many years. With a track record that speaks for itself, we are certain you will be happy if you choose us for your repair. Our technicians are available six days a week for oven repair in Campbell CA and will work around your schedule to arrange the best time for the service call. If your oven is in need of repair, simply give us a call. We will set a time and have our repair specialist go out and address the problem. We know you will be pleased once your oven is working again! Is the broil element not working in your oven? You can diagnose the problem yourself. First, examine the element for blistering and breakage. If it's physically well, use a multimeter to see whether there's power running to it. When doing this test, make sure to unplug the oven first. You can access the broil element terminal from behind your oven as well, where you can check to see if any terminals or wires were damaged. These diagnosis methods require playing around with electricity, so only make an attempt if you are experienced or licensed.